Product failures are never something that a product manager wants to talk about. We all live with the secret dread that someday the product that we are responsible might turn out to be a failure. When that happens, we all expect that we’ll be asked to leave the company. It turns out that we’re all missing an important learning opportunity here. Products do fail and they end up failing for a wide range of different reasons. 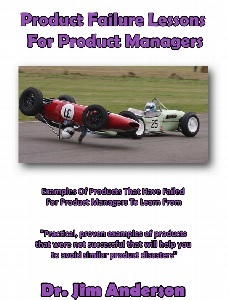 Every product failure is loaded with fantastic learning opportunities for product managers. We just need to take the time an open our eyes to see what we can learn from each failure. Some of the biggest companies out there have suffered very public product failures. Talented product managers at companies like Coke, Dell, Pepsi, Cisco, and Microsoft have all done their best to bring a product to market with the hopes of having a runaway success only to fail. Given all of the resources that they had at their disposal, these failures are even more surprising. As product managers we need to carefully study what happened in each of these cases. There are lessons here for us. The better that we can understand what went wrong at these well-funded and well-staffed firms the better chance we have of avoiding making the same mistakes. Contained in this book are the tips and tricks that you are going to need in order to start to spot when a product is going to turn out to be a failure. As you read each chapter, take a moment to think about how you can start to use the information in your job immediately. I think that you are going to be both surprised and pleased with just how much this information is going to help you to avoid making the mistakes that have caused so many other products to fail!